Coelogyne comes from Greek words koilos and gyne. Literally these two words can be interpreted as female cavities. The name of this orchid refers to the column form (reproduction on the orchid pipe shaped) which becomes the hallmark of the Coelogyne orchid. Orchids have hundreds of species scattered in areas that have a hot to cold climate such as Borneo, Sumatra, Java, India, China and the Fiji islands. These orchids can grow terrestrial or litophytic. Coelogyne has a variable length of hard rhizome. There are even certain types that have rhizomes that propagate with bulbs that stay away from the mother. Rizoma is a stem that grows horizontally along or below the surface of the growing media. Rizoma can form new shoots. Usually for a long time this rhizome will enlarge and function as a place to store food reserves. Coelogyne orchid has some various types of bulb, ovoid (cone, bulging but rather flat), cone (conical) and cylinder (rounded elongated). There are two leaves on one bulb (right and left appearing from the tip of the bulb). The shape of the leaves is wide, long and folded in width (like the leaves of young coconut buds. The main characteristic that is striking is the streak of veins in the direction of the leaf grooves. There are single and composite flower stalk on Coelogyn. Likewise there are those who have long stems and some are short. Flower stalks can appear from the tip of the bulb in mature orchids, but it can also appear together with young shoots. Coelogyne genus has great variety in flower shapes, colors and sizes. 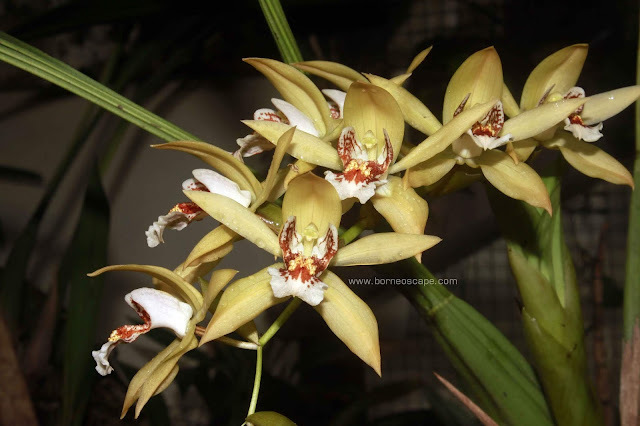 On average or most of Coelogyne has a fragrant smell, like Coelogyne asperata and Coelogyne pandurata (black orchid). Especially the black orchid, this orchid has its own charisma and popularity among hobbyists and collectors because of the unique color of flowers that have a combination of green and black. Coelogyne orchids can be propagated by splitting the clumps. Cleavage can be done by cutting the rhizome. To be safer cutting rhizomes is done by including 2 or 3 bulbs. If you are experienced and have enough understanding of plant characteristics, cleavage can only be done by including one bulb. This applies to Coelogyne who has both short and long rhizomes. In species that have short rhizomes, the method is the same. Tips after splitting clumps: After separating clumps, the plants should not be planted directly but need to be left first in an open place with a base that can store moisture such as mos or small ferns that are rather smooth. This technique needs to be done to condition the plants in stress therapy situations, so the plants will naturally maintain their life and the plants will soon emerge new shoots. Prepare the base by putting mos or chopped fern. Spray it evenly. Done the watering routinely such as caring for adult orchids in general. Planting orchids that have given rise to new shoots. Leave the orchids in that place if new shoots have not appeared. For orchids that are truly healthy, they can produce buds within 2 weeks to 1 month.